Kobo has started rolling out a new software update for the Kobo Glo, Kobo Aura, Aura HD and H2O. The new firmware is labeled as version 3.12.0. Like usual you can wait for it to automatically download and install over Wi-Fi or you can download it from the direct links to Kobo firmware thread at MobileRead. The main thing the new software does is add the ability to read and write reviews for ebooks. Kobo has been without reviews for a long time now ever since they redesigned their website last year. Kobo used to feature reviews from Goodreads before Amazon purchased the company. Now Kobo is finally bringing reviews back. At the same time they are updating their ereaders to add reviews, Kobo has started showing reviews on certain titles at Kobo.com. When available, the reviews appear toward the bottom of a book’s description page below the recommended titles. There’s a link at the top of the page above the price too. Right now the review section at Kobo is limited to “Top Critic reviews” only; there is no option to add your own review like there is with the update for Kobo ereaders. 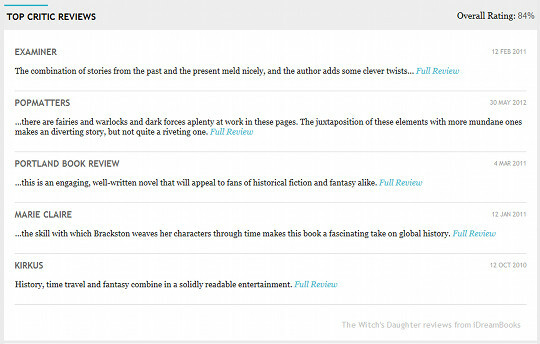 The critics’ reviews are shown as excerpts, with a link to read the full review from the original website. Some titles show an overall rating percentage above the reviews. Outsourcing reviews is certainly a different take than Amazon’s approach. It will be interesting to see how Kobo chooses to implement user reviews as well. It’s good to see Kobo adding more functionality to their previously bare-bones product description pages. They recently started showing format and DRM options for ebooks again too. I see Customer Reviews with star ratings above the Top Critic Reviews. I can write a review too. Weird. 2 days later and I still don’t get that on my end. But then again Kobo’s website seems to be different for just about every country and web browser so I guess it’s not surprising. I’m in the US and using Chrome. I noticed the customer reviews around the same time the download file info was added back. Yeah, you’re right it’s showing on Chrome for me too. Still not with Firefox though. Typical Kobo….